Thanks to two concepts driving the data center today—economy and green computing—server virtualization is a hot topic in the IT world and a lot of hardware and software vendors are offering solutions. Virtualization solutions can have several benefits: they can let you easily migrate a virtual machine from one server to another, and let you provision a virtual as a reproducible clone image for, say,software development and testing. If you are designing your system from scratch, you will likely implement virtualization from the ground up. If your system already exists in the physical state, you will probably want to migrate from the physical environment to the virtual one. I refer to the second process as physical-to-virtual migration, or P2V, and it’s the subject of this article. Several methods, manual and automatic, are generally available to facilitate P2V migration. I’ll talk about those methods and show you how to convert a physical server to a virtual machine using Clonezilla Live, a cloning-based solution. With Clonezilla Live, you first create a system image from the physical server, then use the boot CD to restore the image onto the virtual machine’s hard disk. It’s simple and fast, and it should be useful for software developers, system administrators, and support engineers who want to analyze a system copy while maintaining the original one unchanged (and avoid possible hardware mismatch challenges). Note: Virtual and physical systems hardware and software span a broad range, so the procedures in this article are meant as a reference guide. You may have to do some things differently to get them to work for your migration project. It provides multiple file system and even LVM support, including ext2, ext3, xfs, jfs, and LVM2 under GNU/Linux; FAT, NTFS under Microsoft Windows; and HFS+ under Mac OS. You don’t need a diskless remote boot server (Diskless Remote Boot in Linux, DRBL) in Linux to set it up, as you do with Clonezilla SE. It has a customized capability for boot and recovery procedure. For a successful migration, keep these tips in mind as you follow the steps in this article, and refer back to them as a summary. Make sure the image repository has enough free space to store the data within the partition. You can split images into multiple volume files to avoid maximum file-size limits. Clonezilla won’t support restoring an image from a large hard disk or partition to a smaller one. If Clonezilla Live won’t support the SCSI disk for all VMware versions, use the IDE type for VM creation. To restore the image under the Clonezilla Live shell, you have to be logged in as root. To restore the cloned partition image, the destination virtual disk has to be presented to Clonezilla as formatted. For successful Windows ® migrations, you need solid knowledge of HAL and tools like sysprep. When migrating a physical server to a virtual machine, you may run into the same limitations as when migrating one physical sever to another. For example, you can not move a 64-bit system image to a 32-bit platform. You are also most likely to encounter Hardware Abstract Layer (HAL) issues when restoring a Windows image onto the virtual machine. Many free and commercial tools can help with system migration between the physical and virtual worlds (PlateSpin PowerConvert, VMware Convert, Microsoft® Virtual Server Migration Tookit and the cloning software); these migration tools can also solve the potential problems brought by the hardware mismatch between the physical server and the virtual machine. One of their roles is to pass the necessary drivers to the operating system kernel and initialize the drivers properly during the system boot phase. Of course, most of these P2V tools are more than you need for single-machine migration. VMware Server is a free proprietary platform that provides support for multiple guest operating system types (from Windows, Linux, Solaris, etc.) on both Linux and Windows hosts. As a full virtualization solution, the virtual machine monitors (VMMs) running on the hypervisor provide the virtual machines with all the available types of hardware resources, including the virtual BIOS, virtual memory, virtual SCSI controller, virtual network card, etc. Because the guest operating systems are fully separated from the underlying hardware, they can run unmodified. Now let’s look at P2V migration using Clonezilla Live to clone a Windows system image onto the virtual machine hosted by VMware Server. First, boot the physical server from the Clonezilla Live CD. Clonezilla provides several boot choices. For example, you can select the To RAM option to load Debian Live with Clonezilla into memory and leave the CD-ROM available for other uses. Select the default, and you will get the language and keyboard layout settings. Leave the default as is. Next, choose whether to use a GUI-based backup and restore wizard or a Debian shell for advanced access and operation. Use the Start_Clonezilla option unless you are an experienced user. You’ll see how to use the shell under Restoring the image onto the virtual machine. device-device is for device-to-device direct cloning. device-image is for device-to-image backup. Because you are converting a physical system to a virtual machine, the device-image type is the better choice. Next, you have to select the image directory where the backup image writes to or restores from, as shown in Figure 1. The ssh-server, samba-server, and nfs-server options are useful when you have a network connected, and local disk free space or a backup image is not available. In our case, we will clone the system partition and save it onto another partition within the same hard disk. If you select the local_dev, you have the opportunity to choose the USB device as the Clonezilla image repository. Depending on the internal and external (USB) inserted disks, you are now asked to select the place that will be linked to the image repository, /home/partimag. An image actually is a directory under /home/partimag with all the image-related information and data files. In this example, the system partition /dev/sda1 will be saved as the image put onto /dev/sda5. Thus, sda5 is selected to be mounted as /home/partimag/ as shown in Figure 2. Figure 2 also shows additional command information to mount the image device and the current file system layout with the free space usage report on /home/partimag. Make sure that the image repository has enough free space to store the data within the system partition. 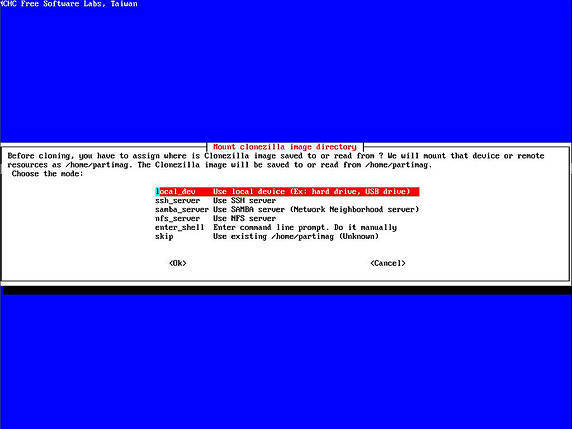 As shown in Figure 3, you can confirm the home directory for the Clonezilla image within the image device. After this step, choose the mode that you are planning to use in Clonezilla Live. You can choose to save or restore the whole local disk or an individual partition. Select the third item, saveparts, for the partition backup. After selecting the mode, you are asked to enter the image name (Sys01-2009-02-23-img) and the source device (/dev/sda1) to back up. The next several figures show advanced options for the image-creation process. Because Clonezilla supports various file system formats and is integrated with partition cloning tools such as ntfsclone, partclone, partimage, and dd, the priority order of the tools to use can be set for the current file system. Leave the default settings if you are not familiar with the file system to be cloned. The default setting of -q (ntfsclone > partimage > dd) is best suited to our NTFS-based backup. Figure 4 shows other parameters that you can set to optimize cloning. For a Windows system image, the option -rm-win-swap-hib saves backup and restore time by excluding the swap and hibernation files. The -gm or -gs options are recommended if you want to transfer the saved image to another place and need to check image integrity when you restore the image. Clonezilla Live also allows you to choose the compression method with efficiency and duration considerations. Some file systems do not support files larger than 2GB, so there is an option to set the maximum file size by splitting the image into multiple volume files. Finally, you can designate an action with the -p parameter to indicate what to do after the cloning process finishes. With your settings chosen, it’s now time to review the operation and confirm your choices. The backup and restore processes both use the ocs-sr tool; after completing the settings through the Clonezilla GUI wizard, the tool shows you the ocs-sr command with the necessary parameters for achieving the same result from the command line. It also creates a temporary file containing the command, saved under the /tmp directory. Now, sit back and wait for the backup to be completed. After it’s done and the server boots up, transfer the image directory from the physical server to the place you will use as the restoration source for the virtual machine. From here on, we’ll be creating a virtual machine within VMware Server as the destination for system migration. Make sure that the host environment complies with the VMware Server and guest operating system requirements and limitations. Because the virtual machine will use the same processor as the host as a baseline, it requires that the host environment and the cloned physical server have compatible types of processors. 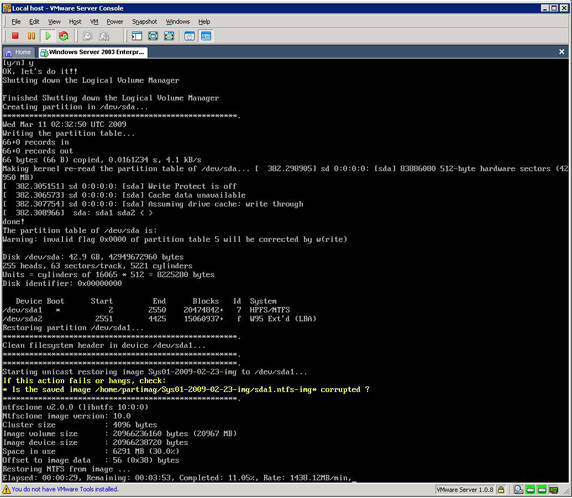 First, use the VMware New Virtual Machine Wizard to create the virtual machine. During the process, select the operating system version that matches the cloned one from the physical server. Also, you have to create a virtual disk equal to or larger in size than the partition where the original cloned system resides; Clonezilla does not support restoring an image from a larger hard disk or partition to a smaller one. During the Clonezilla Live restoration process, however, you are able to restore the image to a large hard disk according to the original disk layout. 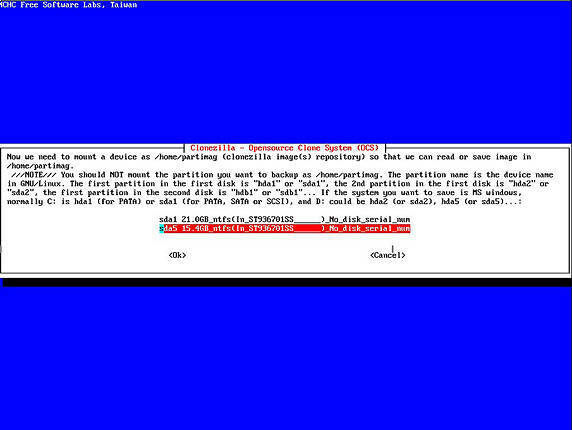 Note: The Clonezilla Live kernel might not support the SCSI disk for earlier VMware Server versions. In this case, when you create the virtual machine, use the IDE type for the virtual disks. 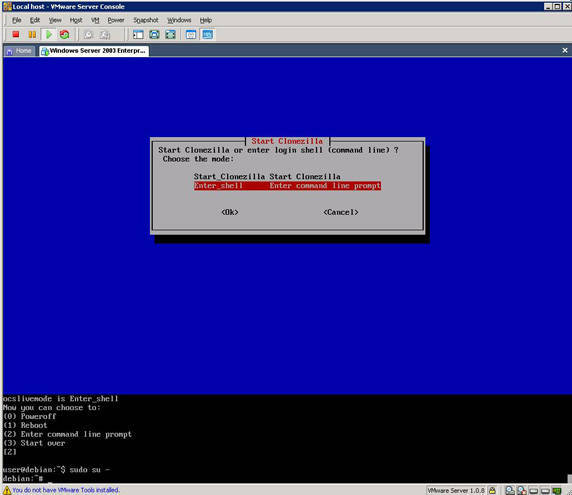 Second, change the virtual CD-ROM device to use the Clonezilla Live ISO image for the virtual machine, as shown in Figure 6. Third, put the system image files from the previous section under the host server’s second disk, Partition 0 of PhysicalDrive 1. 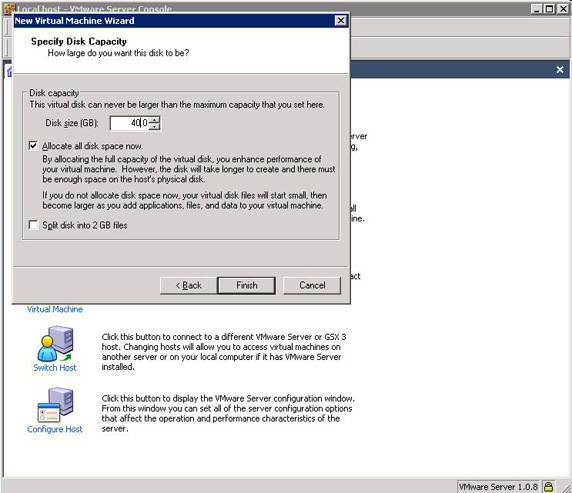 Because VMware Server supports pass-through SCSI drive access on the host system, add another hard disk for the virtual machine with Partition 0 of PhysicalDrive 1 directly attached in VMware. At the restore phase, this device will be presented to /home/partimag. Now that you have a compact virtual machine created, it’s time to boot the virtual machine from Clonezilla Live. After the virtual machine boots up from the Clonezilla Live image, Clonezilla Live has the same GUI-based wizard interface for restoration as for backup until you choose the mode, as shown in Figure 8. 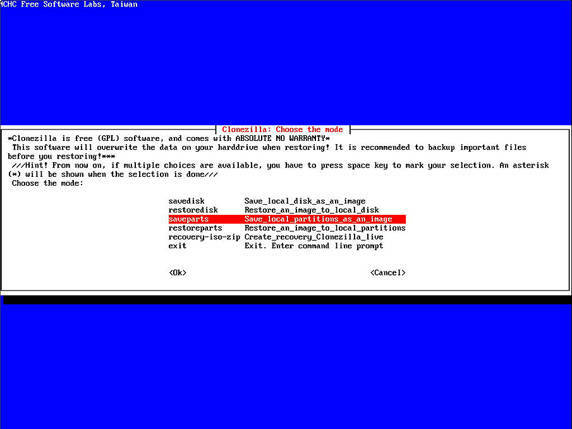 In this example, we will enter the Debian-based Clonezilla Live shell directly to select a manual restoration. To restore the image under the Clonezilla Live shell, you must log on as root, as in Listing 1; this gives you full access to Clonezilla. /dev/sda is the virtual disk we created as the restoration destination; it is unformatted. /dev/sdb is PhysicalDrive 1 of the host server that we attached to the virtual machine directly in the form of a pass-through SCSI device; we have the cloned system image on it. Calling ioctl() to re‑read partition table. As with the backup procedure, you must mount a writable device or space as /home/partimag, then Clonezilla will search the cloned image directory under /home/partimag. To prepare the restoration from the image on the partition /dev/sdb1 to the newly created partition /dev/sda1, first mount /dev/sdb1 to /home/partimag with the writable privilege. Note that here, /dev/sdb1 is an NTFS file system on the host server, and it may be open, so a force option might be required to mount it successfully. See Listing 4. When /home/partimag and the destination partition are ready, you have to choose the best way to restore the image for your environment. Just as for backup, Clonezilla provides a variety of advanced and flexible options for image restoration. See Figure 9 for the restoration parameters and their meanings. For Windows system image restoration, the boot header has to be written to the destination disk. To achieve this, use -j0 (use dd to create partition table) and -t1 (client restores the prebuilt MBR from syslinux). The hnX PC (X is 0 or 1) option is good for ensuring that your environment has a unique Windows machine name. In case you don’t want to keep your current destination partition layout, you also can try -k1 or another partition-relation parameter to create another partition table. Listing 5 restores the image Sys01-2009-02-23-img from /home/partimag (/dev/sdb1) to the destination device, /dev/sda1. Figure 10 shows the summary and progress updates you’ll receive after you confirm the choice. After that, you have your cloned system on a virtual machine. Clonezilla site The Clonezilla site provides full and detailed information and resources on Clonezilla Live. Manage partitions and disks with GParted-Clonezilla live CD "Manage partitions and disks with GParted-Clonezilla live CD" (Linux.com, July 2007) provides a guided tour of Clonezilla. DRBL FAQ/Q&A The DRBL FAQ/Q&A can answer many questions you might have about Clonezilla Live. VMware VMware provides data and documentation on its virtualization technologies, including the VMware Server. 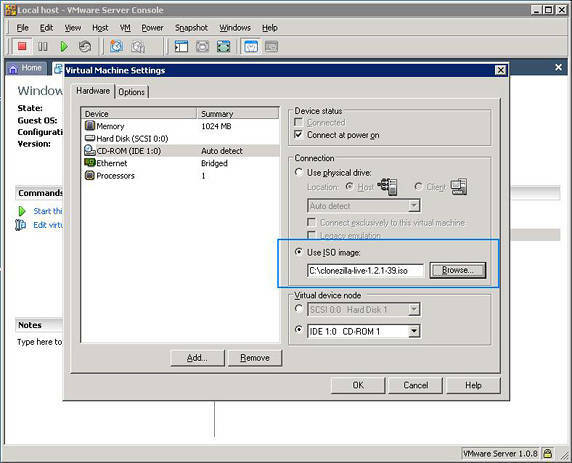 VMware Server VMware provides data and documentation on its virtualization technologies, including the VMware Server. How Convert Physical to Virtual "How Convert Physical to Virtual" (VMTS) shares valuable experience on P2V migration via cloning.